Dates from the period following Hallam’s death. 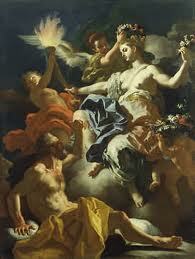 Tithonus was loved by Aurora, the goddess of the dawn: she gave him immortality but omitted to give him eternal youth. In Tennyson’s version, Tithonus is not given the Greek myth’s reprieve of being turned into a grasshopper. Withered in extreme old age, life is no longer a blessing. This is a lament about fading youth and also about the poet’s possible loss of creative power. Whilst Ulysses yearns for more, Tithonus yearns for oblivion. The hero is marginalised by his immortality and cut off from his fellows, ‘the kindly race of men’. Why is blank verse used? What contrast is made between the persona of Tithonus and the natural world at the beginning of the poem? What is the effect of the inversion in line 5, with regard to rhythm and intention (deal with the use of the trocheeˉ ˘ instead of the iamb˘ ˉ)? Why does Tithonius refer to himself as ‘he’ (lines 11-14)? The dramatic monologue is imagined as being spoken at dawn and the gradual spread of light. Consider how it is done. What is the effect of the poet addressingAurora? Find words and phrases to show the contrast between the aged Tithonius and Aurora. Analyse their impact. Identify the joys of youth, as presented in the poem, and consider language use. Look at and consider the use of colour. It has been said that the poem is a realisation of a long and meaningless future, after Hallam’s death. Find evidence that might support this view.